Christine Datian must have been reading my mind. As I was doing my eggplant experiment in Florida, she was creating an eggplant recipe of her own in Nevada. Her recipe for ‘Grilled Eggplant and Chopped Salad with Lemon - Mint Dressing’ recently appeared in The Armenian Mirror-Spectator newspaper. 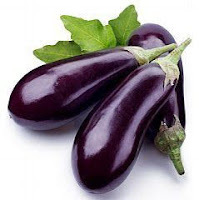 I offered to post it to present another way one can serve eggplant. She was happy for me to do just that. So fire-up your grill and get ready to entice your family with this delightful summertime recipe! 1. In a medium bowl or container, combine the salad dressing ingredients; check seasonings, cover and chill before serving. 2. Pre-heat grill for 10-15 minutes and grill eggplant on both sides until tender, about 8 to 10 minutes. Brush eggplant with a little olive oil, salt and pepper as it grills. Remove eggplant from the grill and set aside on a tray or plate. 3. In a large bowl, toss the salad ingredients together, including the pita bread pieces; add some dressing to taste, and toss again. Plate salad on four serving plates; top with eggplant, additional salad dressing, cheese, and the chopped apricots, pomegranate seeds, walnuts, and pine nuts as garnish. Variations: Top this salad with choice of sliced grilled chicken, lamb, pork or steak, if desired. Christine Vartanian Datian is a native of Fresno, California and lives in Las Vegas. She is a graduate of Fresno High School and California State University, Fresno (CSUF), and holds a Master of Arts Degree (MA) in Mass Communications. She has been published in Sunset and Cooking Light Magazines for over a decade and is regularly featured in the Armenian Mirror-Spectator Newspaper. Not strictly related, but I saw a travel video (Yerevan) at https://www.youtube.com/watch?v=oiUT794BOnY which mentions and shows "Kovsakan Salad" (Beef, bell pepper, hot pepper, onion, greens, dressing, spices) and khurjin (Lamb, onion, bell pepper, tomato, sauce, spices, wrapped in lavash, almost like a pot pie). They look delicious and are praised in the video (which also thumbs through the menu at a Yerevan restaurant--very readable with the 'pause' button). Any information--or recipies!--would be welcome. I sent your request to my culinary expert in Yerevan, to which she replied: "Kovsakan means Caucasus. I'm sure the dish is not Armenian.I think that is a creative dish; not traditional. KHURJIN is also new a creation, it means parcel. I have tried its vegetarian version once, which was fried vegetables, like a Chinese dish- all vegetables cut into strips & fried in oil, then wrapped in lavash, tied & baked in the oven. I hope this is somewhat helpful. Our chief cook, Robyn Kalajian (Robyn@TheArmenianKitchen.com), is a retired culinary teacher. Sous chef Doug Kalajian is an author and retired journalist. Preserving a heritage one recipe at a time! Welcome to TheArmenianKitchen.com, where you will be inspired by an ancient cuisine, experiment with exotic ingredients, master cooking techniques you were afraid to attempt, and so much more. It doesn’t matter where you live, what your ethnic background is, whether your food preparation skills are very basic to highly professional, or what your finances are, everybody has to eat. Food connects us across all boundaries - generational, national, physical, social, nutritional, and cultural. It’s fun to share meal preparation with family & friends, try regional recipes of one’s own nation, explore the intricate flavors of another country, or learn the importance behind the art & science of food preparation. Armenian recipes are as varied as their regions and dialects. No two chorag recipes are alike! You are invited to share your family’s favorite recipes along with a little background about them, perhaps stories about cooking with “nanny”, or whatever inspires you in your kitchen. Just click on whatever interests you in one of our Recipe Links below -- and please add your recipes, anecdotes or suggestions as comments. There's also a storehouse of ingredients, tips and even more recipes in The Armenian Pantry. We love to share -- but please be fair! Now read us in Armenian!